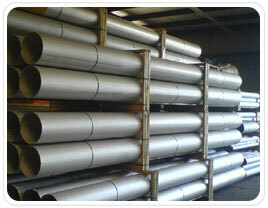 410 stainless steel is a hardenable martensitic stainless steel alloy. Unlike austenitic grades it can be heat treated (“quench and temper”) to generate high strength with good ductility. 410 alloy is required when strength, hardness and wear resistance is required with some corrosion resistance. Due to the hardening capabilities of this steel, other properties and the resulting performance of this material are somewhat compromised. The alloy can only effectively be used in mildly corrosive environments. The operating temperature range is limited a) a loss of strength by over tempering at elevated temperatures and b) a loss of ductility at sub-zero temperatures. Grade 410 is the basic martensitic stainless steel; like most non-stainless steels it can be hardened by a “quench-and-temper” heat treatment. It contains a minimum of 11.5 per cent chromium, just sufficient to give corrosion resistance properties. It achieves maximum corrosion resistance when it has been hardened and tempered and then polished. Grade 410 is a general purpose grade often supplied in the hardened, but still machinable condition, for applications where high strength and moderate heat and corrosion resistance are required. 410 Stainless Steel Pipe and Tube Packing410 Stainless Steel Seamless Pipes and Tubes is sleeved into plastic bag individually, pieces wrapped with water-proof material, bundled with nylon rope. Clear labels are tagged on the outside of the package for easy identification of the quantity and product I.D. Great care is taken during operation and transportation. SS 410 ASTM A312 Seamless Pipe packing will be according to international standard in bundles strapped by strips then into containers to avoid any damage. – End of SS 410 ASTM A312 Seamless Pipe protected by plastic caps. We export 410 Stainless Steel Seamless Pipe and Seamless Tube to Iran, Iraq, Oman, Qatar, Albania, Muscat, Bahrain, Turkey, Egypt, Maldives, Italy, UAE, Bahrain, Indonesia, Australia, Kuwait, Saudi Arabia, South Africa, Germany, UK, Denmark, Canada, USA, Peru, Brazil, Nizeria, Mexico, Venezuela (Latin America), South America, Russia, kazakhstan etc. Steber Steel is a well known worldwide exporter of 410 Stainless Steel Seamless Pipes and Tubes, Steber Steel is committed to provide each and every customer with the highest standard of customer service. We deals in 410 Stainless Steel Seamless Pipes and Tubes in India & Overseas, offering a wide range of 410 Stainless Steel Seamless Pipes and Tubes.